Have you heard of Yudanaka Onsen? This hot-spring resort is well-known as the entrance to Shiga Highland, which was a venue for alpine events during the Nagano Winter Olympics in 1998, and, in recent years, as the site of the Snow Monkey Park, where you can watch charming Japanese macaques (“snow monkeys”) bathing in steamy outdoor hot springs amid the falling snow. In winter visitors can relax in the hot springs after enjoying the powder snow and the snow monkeys. But the attractions of the area are certainly not limited to that season. In summer and autumn visitors can also enjoy trekking in Shiga Highland (for more information on these seasonal delights, see the feature article titled “Ways of Enjoying the Highland: Shiga Highland UNESCO Eco Park“). And at the summit of the Ryuoo Ropeway in Kitashiga Highland, there is the popular Sora terrace observation deck, from where, if the conditions are right, you can see a sea of clouds below and sometimes the evening sun falling into this misty ocean. 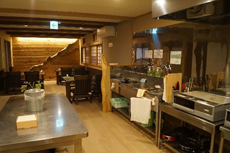 Furthermore, various new types of café, restaurant, and lodging facilities have been appearing in Yudanaka Onsen recently. I went along to check out its attractions. The Sora terrace looks down on a fantastic sea of clouds. Ryuoo Mountain Park in Kitashiga Highland is a popular ski resort in winter, attracting many skiers from Japan and overseas, but this time I had come to experience the attractions of the green season. 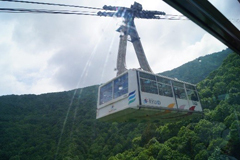 The foot of the mountain is connected to the summit by a world-class ropeway with a capacity of 166 passengers. The journey up the 1,770-m mountain takes about eight minutes. As the gondola goes up, the vista gradually widens. On the day when I visited, there was no sea of clouds, so such landmarks as the nearby Mount Madarao, Mount Myoko, the city of Nagano, and the town of Obuse were clearly visible. 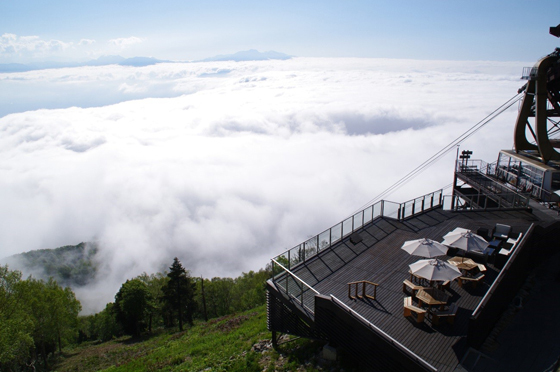 On days when the sea of clouds forms, visitors can enjoy a fantastic view like the one in the photo above from the SORA terrace, which has been built on a steep slope near the summit ropeway station. Even in July and August, at the height of summer, the average temperature at the summit of Mount Ryuoo is a cool 18 degrees Celsius. For a moment of real bliss, sit back and enjoy the splendid view from the observation deck while sipping a coffee bought at the Sora terrace’s café. Mount Ryuoo is also famous for its marvelous autumnal hues. The trees begin to change color from late September until early October, after which, if you are lucky, you can enjoy the grand views, the autumnal tints, and the sight of the evening sun dipping into the sea of clouds, all at the same time. 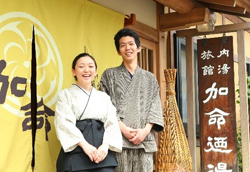 In recent years cafes and restaurants serving creative cuisine utilizing local ingredients have been opening one after the other in the Yudanaka Onsen hot-spring resort, which lies within walking distance of Yudanaka Station, the last stop on the Nagano Line. Chamise was so named to evoke the image of the roadside teahouses that served tea and light meals to tired travelers during the Edo period (1603–1868). Those teahouses not only provided relaxation and refreshments to travelers but also served as guideposts, thus contributing to the safety of travel. 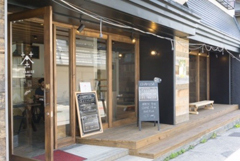 Chamise Café and Space, which is situated near the entrance to Yudanaka Onsen, similarly offers a physically and mentally relaxing space, and (in keeping with the modern age) Wi-Fi, to travelers from Japan and overseas. Its menu includes fresh fruit juice made using locally grown materials, coffee, and French toast. Chamise also provides detailed information about local sightseeing spots required by travelers. So if you are traveling to Yudanaka Onsen, Shiga Highland, or anywhere else in the vicinity, by all means drop in to Chamise on your way. Nagano Prefecture, where Yudanaka Onsen is located, is famous for its abundant fermented food products, including Shinshu miso, which is popular nationwide, soy sauce, sake, koji (mold used in sake production), and pickled vegetables. As long as you do not consume too much salt, fermented food is good for your health. 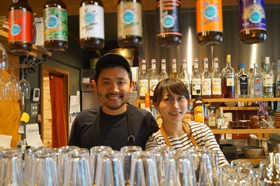 Hakko is a restaurant specializing in local produce and especially locally produced fermented food. Housed in a renovated residence of the Meiji period (1868–1912), the modern Japanese-style restaurant also serves more than 20 types of craft beer, including local beers. The popular dishes make plentiful use of locally made fermented products, such as miso, soy sauce, sake, yoghurt, bread, pickles, koji, and cheese. The lunch is so generous, it might even be too much for ladies. The owner and chef, Tomoki Kimijima, and his wife Yumiko commute from Nagano City, but nevertheless the restaurant is open until 23:00. 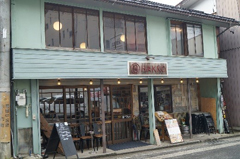 Hakko’s food is popular among not only tourists but local residents too, and in the evening it is crowded with customers enjoying the cuisine made from local produce and comparing the merits of the various craft beers. Discovered in 1350, Yudanaka Onsen has many hotels and lodgings of all sizes. Among them, two unique hostels that opened recently are introduced here, as well as a ryokan (Japanese-style hotel) with impressive art lamps made of handmade washi (Japanese paper). 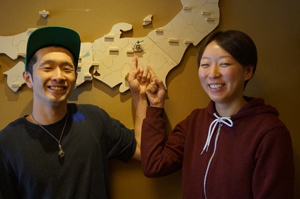 According to the manager, Tatsuya Kobayashi, the concept of the Zen Hostel, which opened in 2016 in a renovated 233-year-old building, is a “blend of Japanese and Western styles.” In refurbishing the hostel, Kobayashi imagined a Japanese-style entrance on the first (ground) floor leading to a Western-style café space where local people and guests drank coffee or beer and engaged in exchange. Further back there is a Japanese-style lounge exclusively for guests, where guests can engage in exchange among themselves. In Japanese-style space, such as tatami rooms, guests take off their shoes, but elsewhere they can keep their footwear on. Having been built on the themes of a blend of Japanese and Western styles and exchange between people, the Zen Hostel is a comfortable place for Japanese and foreigners alike. Interchange is already beginning. Some local Japanese who come for a drink in the evening invite foreigners whom they acquaint in the Café & Dining Bar to go skiing the next day; others comes and spontaneously start teaching non-Japanese visitors how to play traditional Japanese pastimes like kendama (a cup-and-ball game). While I was at the hostel, even though it was still morning, a couple of backpackers checked in. 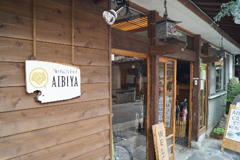 When I asked, I was told that the owner, Akihito Morita, in light of his own personal experience overseas, tries hard to take the situations of guests into account and as far as possible permits early check-in without any extra charge. 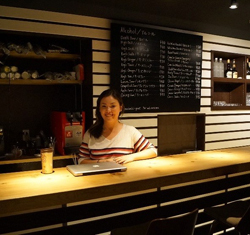 I also spoke to Maya Oshita, who was working at the bar counter. Maya, whose mother is American, told me that she not only works at the hostel but also teaches English to local folk. Miho Yokozawa, who had just come for a lesson, told me that she had begun to study English on the recommendation of her father, who had taken a liking to both the bar and Maya. 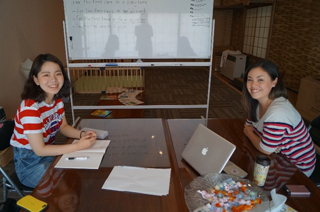 After studying English conversation for a bit, no doubt Miho, together with her father, will try talking to the foreign guests. The Nishizawas point to Yudanaka Onsen on the map. 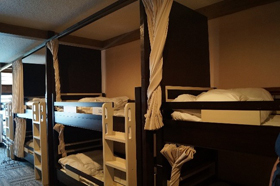 When he first stayed at a hostel in Canada as a university student, Yoshiki Nishizawa, the owner of Aibiya, determined to open a hostel within the next decade. He subsequently worked at a ryokan in Tokyo that attracted many foreign guests and learned about the hostel business in Australia and New Zealand. He also traveled around Asia and Europe in order to understand the feelings of travelers. 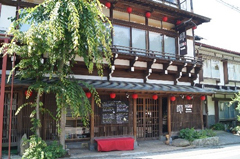 As a result, the ideal image of a hostel that Nishizawa came up with was a lodging that offered an “escape from travel.” As a manifestation of this idea, he built Hostel Aibiya in Yudanaka Onsen. On the wall in front of the reception there are three-dimensional maps of Japan and Nagano Prefecture, so travelers can see where they are now and where they are heading. On the opposite wall, there is a list, in Japanese and English, of 12 things to do here in “snow monkey town.” The list includes hiking in Shiga Highland and comparing the beers available at the Hakko beer bar. The whole of the first (ground) floor is a common space where travelers can relax. Guests can freely use the kitchen. Since foreigners (especially Europeans and Americans) tend to have just a light breakfast, items like fruit, eggs, cereal, bread, milk, juice, and coffee are available in the kitchen so that people who want to eat can do so. 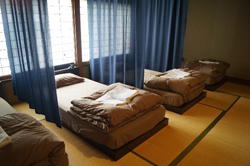 The lounge, a tatami room with cushions, can be freely used as well, and the dormitory, also a tatami room, has well-arranged low beds. The top priority, after all, is making sure that guests get a good night’s sleep. Nishizawa said that he and his wife Seongmi, a Korean whom he met in Australia, were determined to provide a lodging that eases the weariness of travel. The Kameinoyu ryokan is run by Kyohei Takayama, who learned the trade at the venerable Yorozuya ryokan in Yudanaka Onsen, and his wife Ruri. When I was shown around, I noticed washi lamps in the image of flowers placed here and there creating graceful, fantastic lighting. Apparently Takayama loved the washi lampshades produced by Koichi Kikuchi, a lighting artist living in Nagano Prefecture, so when Yorozuya built Kameinoyu and appointed him as manager, he proposed that the hotel be decorated with Kikuchi’s art lamps. 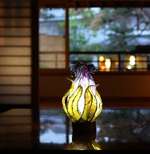 Kikuchi’s lamps, designed with the motif of flowers and plants, are characterized by their graceful and soft light. They create an extraordinary atmosphere in the interior of the ryokan and the Japanese garden. Art lamps lighten up the garden and rooms. Another feature of this ryokan is that it only serves breakfast. For evening meals, guests are recommended to go to Yorozuya for Japanese-style cuisine or to eat out at the local French and Italian restaurants. By choosing the restaurant of their choice and eating out there, guests are able to also enjoy the atmosphere of the hot-spring resort in the evening. Going to a fully French restaurant wearing a yukata (light summer kimono) is a pleasurable experience too. Kameinoyu is certainly a brand new type of ryokan. Much to the delight of female guests, Kameinoyu offers a choice of colorful yukata as well. The ryokan has hot-spring facilities itself, of course, but guests can also go out to Yorozuya’s Momoyama Bath, which is a cultural asset, or the public bathhouse used by local residents. Strolling along the streets of the spa in a colorful yukata, carrying the cute basket of bathing necessities available in each guestroom at the ryokan—What more could you want?